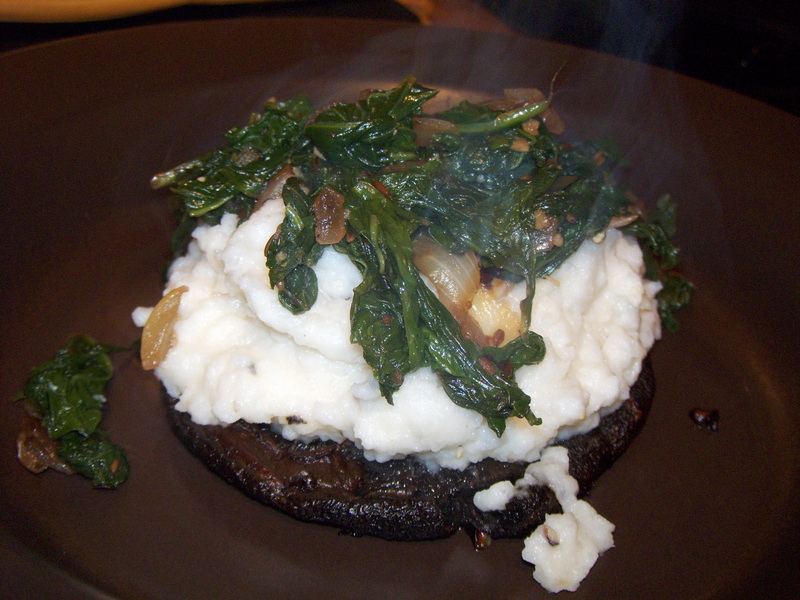 Yummy baked portobellos topped with mashed turnips and potatoes and spicy mustard greens. Super satisfying and fancy enough for a dinner party, yet surprisingly quick and easy and light. Mix the oil, vinegar, herbs and garlic in a large baking dish. Toss the portobello mushrooms in the mixture, basting with the juices, cover and put in the refrigerator to marinate for about 2 hours. Preheat the oven to 425. Drain the mushrooms and cook on a lined baking sheet for about 20-30 minutes. Put the turnips, potato and thyme in a pot and cover with water. Bring to a boil then simmer for 20-30 minutes or until the vegetables are tender. Drain, remove the thyme and return veggies to pot. Add in the goat cheese, butter and cream and mash with potato masher until smooth. Taste for S&P. Saute the onion in some oil until soft. Add the cumin, garlic and red pepper flakes and saute for another 2-3 minutes until fragrant. Add the mustard greens in bunches, allowing the greens to wilt before adding the next handful. Cover with a lid and let cook for 20-30 minutes. Add vinegar at the end. Taste for S&P. If you’ve timed everything just right – all the elements should be ready at just about the same time. To assemble, place the mushroom on a plate, top with the mashed turnips and then the mustard greens. Enjoy! I love the steam coming off of the Tower of Power! Looks really good. See ya soon.